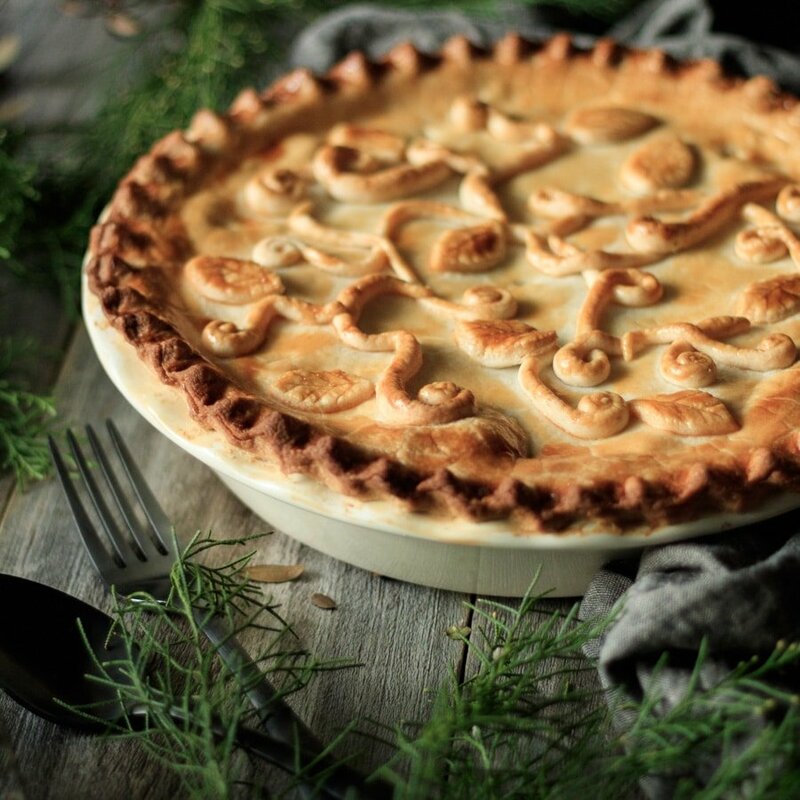 Creamy chicken and mushroom pie is an easy recipe that combines leftover chicken with a flavorful gravy and flaky shortcrust pastry. This fabulous comfort food is sure to be the star of your next dinner. Learn how to cook it from scratch with this recipe! Mushrooms are one of my favorite additions to a main course. 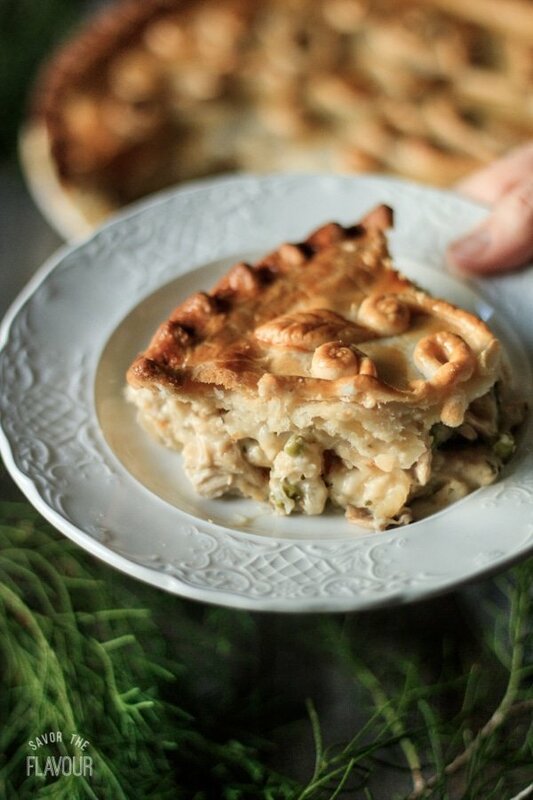 They have such a wonderful earthy flavor and unique texture that pairs perfectly with so many dishes–including this creamy chicken and mushroom pie! This classic British family pie is a flavorful way to turn leftover chicken into a mushroom-filled comfort food. 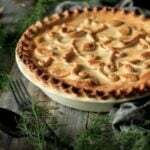 Chicken and mushroom pie is a traditional British pie, often topped with puff pastry. It’s just the sort of thing to serve up on a chilly winter evening! 🥧 I’ve made a few tweaks to the traditional version: I’m using flaky shortcrust pastry instead of puff, and I added some peas to the creamy filling. 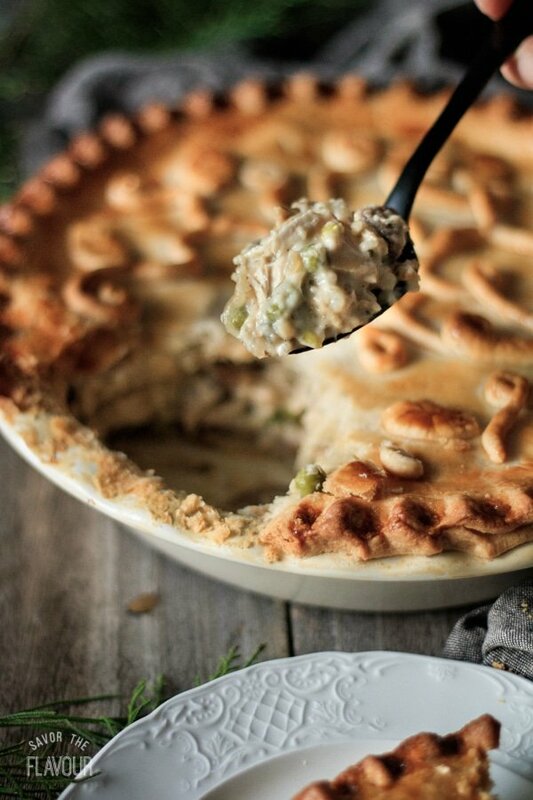 It’s such a treat to cut into the golden crust and scoop out a steaming piece of creamy chicken pie!! Your family will appreciate the love and care you put into each ingredient–from the homemade pastry to the creamy gravy inside. 😋 Trust me, you’ll be glad you made this! Wash and slice the mushrooms. Chop the onion and mince the garlic. Melt 3 tablespoons of butter in a large frying pan over medium-high heat. Once the butter is bubbling, add the mushrooms and turn down to medium heat. Cook the mushrooms until all the liquid has evaporated and the mushrooms are soft and brown, stirring occasionally. While the mushrooms are cooking, melt 1 tablespoon of butter in a small frying pan until bubbly. Saute the onions until they’re soft, then add the garlic and cook over medium heat until golden brown. Deglaze the pan with the white cooking wine and scrape the golden-brown fond from the pan. Spoon into a medium bowl and set aside. Add the cooked mushrooms to the bowl of onion and garlic. Chop the chicken and add it to the bowl of veggies. Measure out the butter, flour, chicken stock, and milk for the gravy. In the same frying pan you used for the mushrooms, melt the 6 tablespoons of butter over medium heat until bubbly. Dump in the flour and whisk for 1-2 minutes. Immediately whisk in the chicken stock, then gradually whisk in the milk. Cook the gravy for several minutes, whisking constantly, until the gravy is quite thick. Turn the heat to low and stir in the lemon juice, spices, and frozen peas. Pour the gravy into the bowl of chicken and veggies and stir thoroughly. Set aside to cool. Preheat the oven to 400 F and put a heavy rimmed cookie sheet in to preheat. Spread the filling mixture evenly in a 9-inch deep dish ceramic pie plate. Roll out the chilled pastry on a lightly floured surface. Using a plate as a template, cut out a circle of pastry large enough to cover the pie plate. Cut out another circle from inside the circle of pastry to create a circular strip of pastry that will fit on the lip of the pie plate. Brush the rim of the pie plate with beaten egg and gently press the circle of pastry onto the rim to adhere it, then brush the pastry with beaten egg again. Re-roll the remaining pastry and use it to cover the the pie. Gently press down along the edges to seal the pastry together, then trim off the excess with a sharp knife. Pinch the edges to decoratively crimp the pastry. Cut out a few small leaves and use the knife to draw veins on each leaf. Roll some pastry into long, thin ropes to make vines. 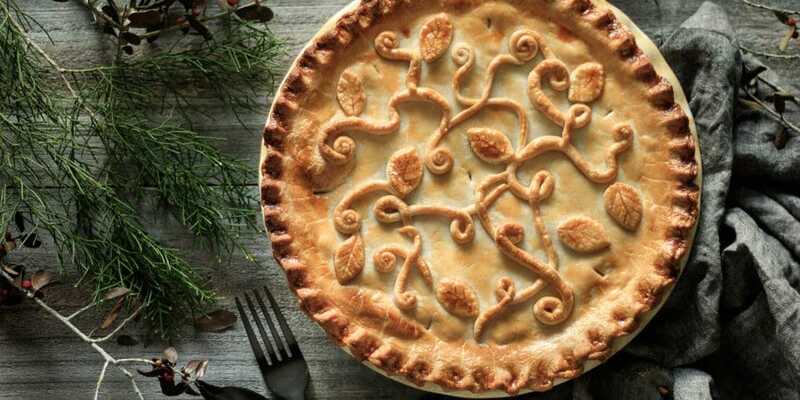 Arrange the leaves and vines on the pie as desired, then brush the whole pie with beaten egg. Cut a few vent holes in the top. Bake at 400 F for 40-45 minutes until well browned. Let the pie cool for 15 minutes before serving. If you’re using the gravy within an hour of making it, let it sit over low heat, stirring occasionally. For longer storage, place in the fridge.